Awesome cards Tracey! I love the life preserver card with the rope! 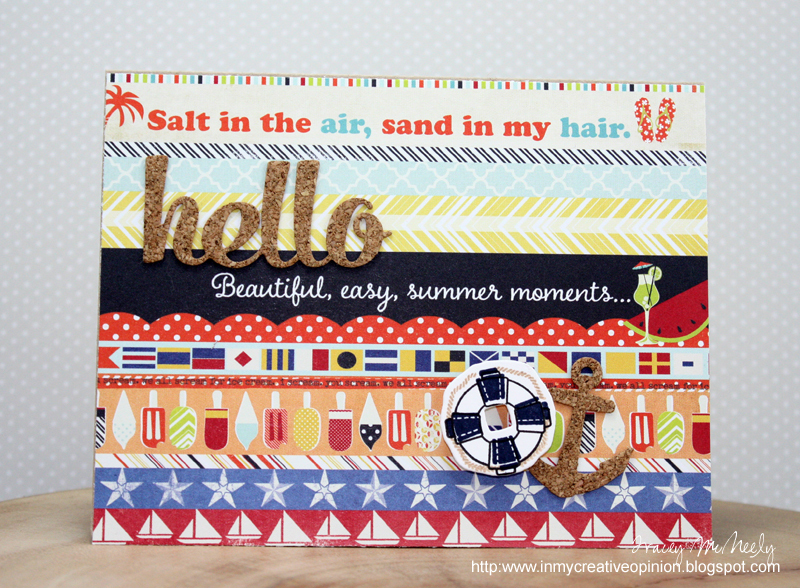 !The nautical flag card is so pretty! !The card with the cover plate is so striking backed with navy!! Awesome! Tracey all of your cards are just great - so many different aspects that are special: the rope-y happy stamp; the windows cover die; tiny flags!!! You're introducing me to another new thing today, my friend - thanks!! Wow wow wow!! You have been busy!! These are all gorgeous!!!! Of course they're all simply perfect! Joyce did an awesome job and I still have so much left over! WOW! All these are amazing!!! Love each and every one! WOW! 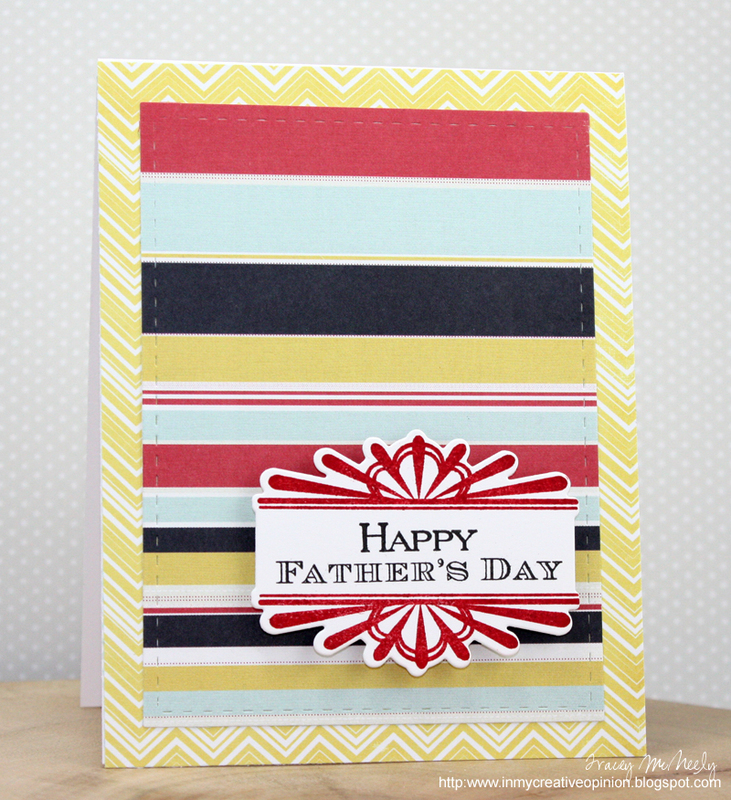 What a fun kit and all your cards look fabulous. So much variety. Wow!!! So many great goodies in here, personally I love the woodgrain and cork thanks and the boat with the cover plate. Yay for having everyone home! Check out all of your wonderful cards! I really love the nautical theme! 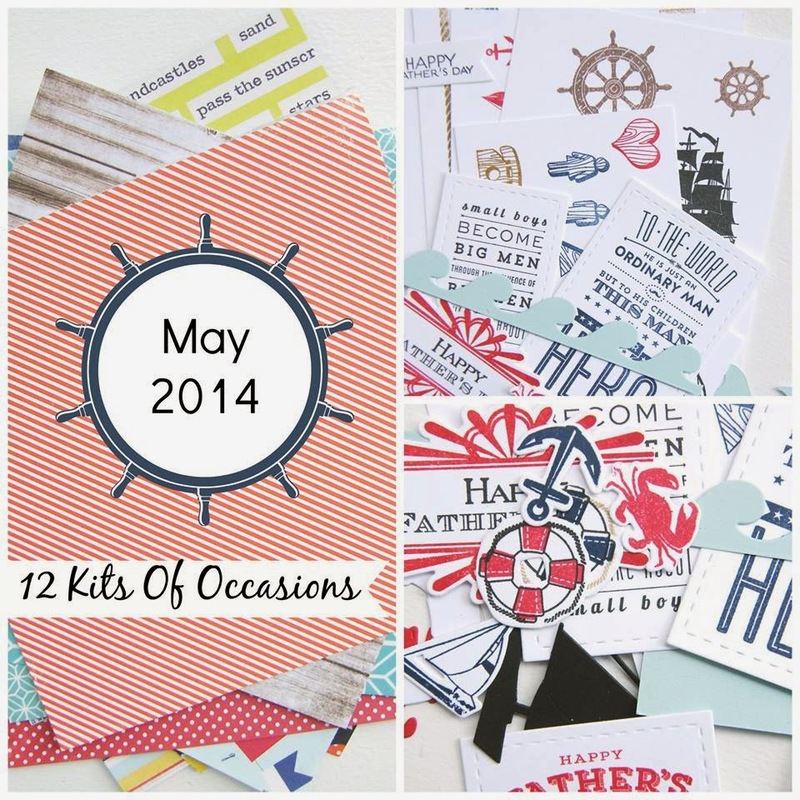 I couldn't wait to see wait all of you did with the nautical kit. And you, my dear friend, did NOT disappoint!! Beautiful work Tracey. I am especially fond of the second card!! These are all fantastic. I cannot believe you made 8 cards--you must have stayed up all night. They are all CAS and just fantastic. You are giving me great ideas for how to use the supplies. I always look forward to your cards lined up on the window sill Tracey...you really must have loved Joyce's kit...can't believe all the cards you made! 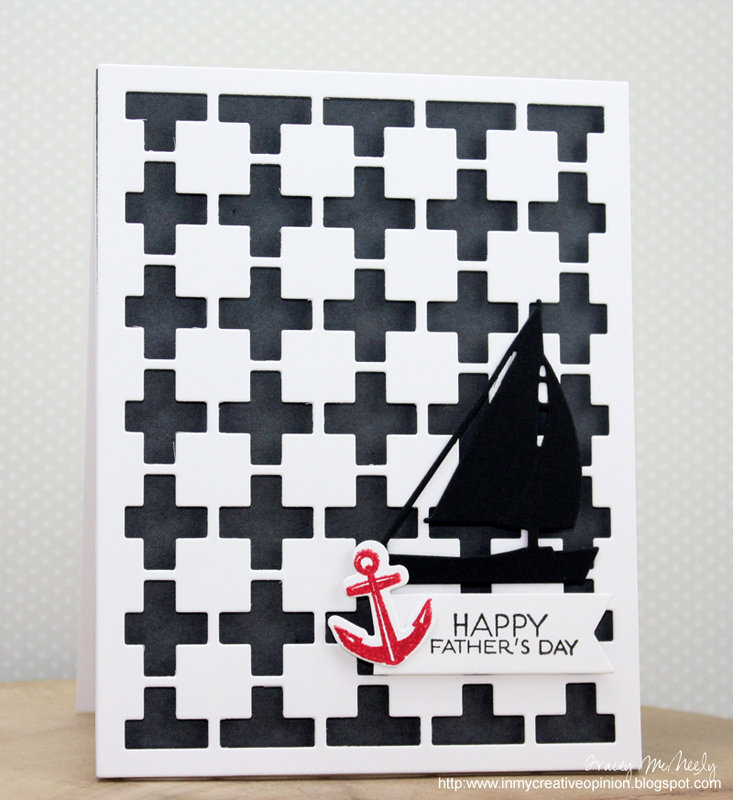 I especially love the salt in the air patterned paper card...just a gorgeous card and one I wish I had made myself! Great job this month! 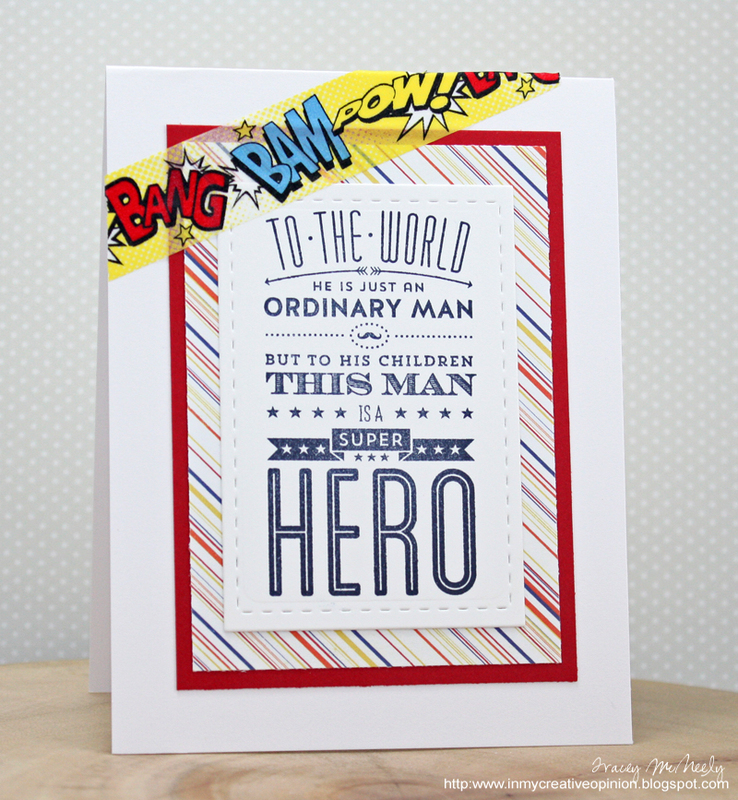 Wow...what a wonderful collection of fabulous and fun cards. I love each and everyone of them! As always, I love your clean style and that super hero washi tape is just too darn cute! 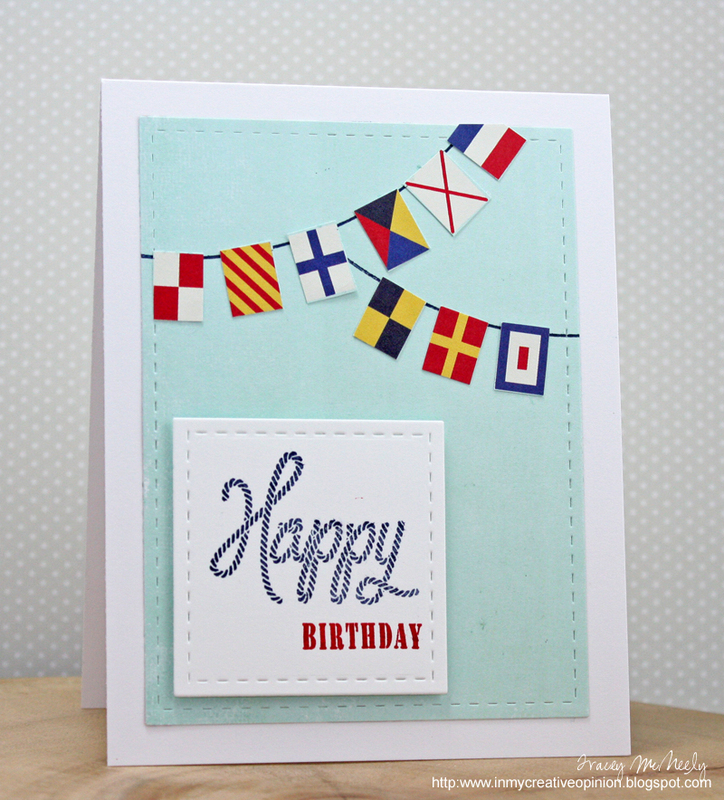 Just love this nautical theme - those flags are superb. And I'm lovin' the life preserver on woodgrain (coming from a harbor town, ya know). Happy weekend. Wow, what a great collection of cards! Wasn't this an amazing kit? 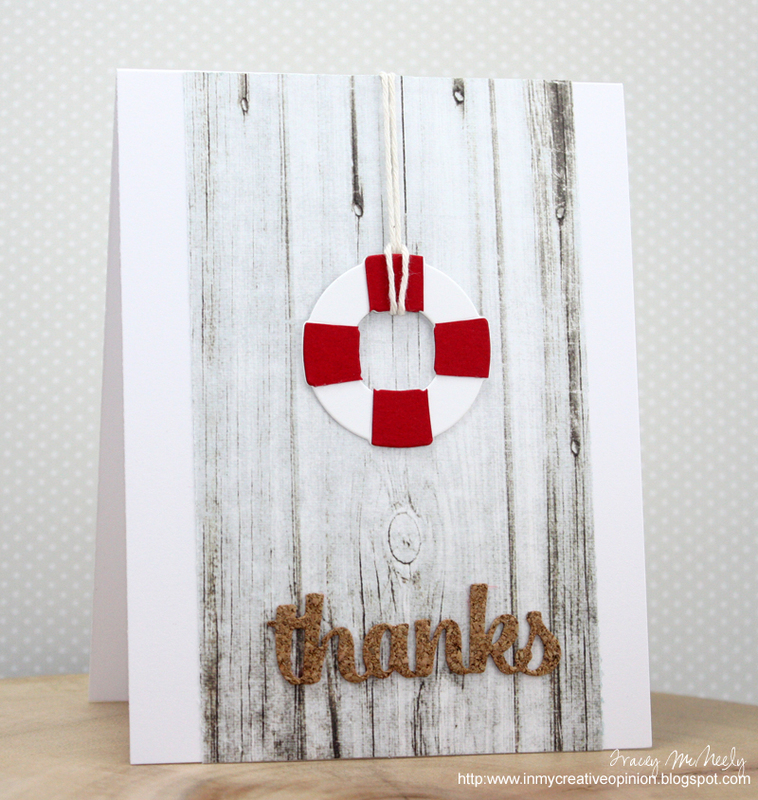 Love your design with the life preserver on the woodgrain and your great card using the flags. 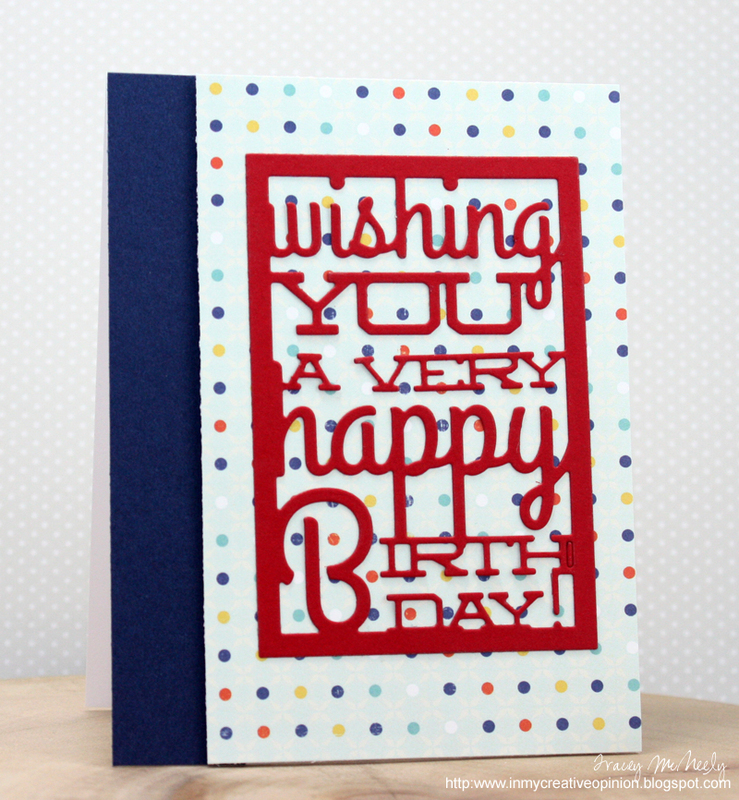 The last card with the birthday die cut on the dotted background makes such a fun design--a great card to have on hand, perfect for anyone. Enjoy the rest of your weekend with the whole family! A gorgeous assortment of cards Tracey! Enjoy having your family all together. Just like every other kit.... You nailed this kit too, superb nautical creations ! They turned out fantastic Tracey! What a great kit! I love them all Tracey. Its so cool to see the different ways we all interpreted the kit The washi on the first is the perfect touch and it grabbed my eye immediately. The banners set on their side with the bitty twine bow.. and the stripes mixed with the chevrons so unexpected and daring - and it works!! So smart to use the striped pattern paper - letting it all show with a few embellishments, and you're going to laugh, but that sentiment die totally had me stumped. Looks wonderful - like a party with the polka dots peeking through. A truly wonderful group of cards, Tracey. Wow! What a fabulous collection of awesome cards! You did wonders with the kit! Love every one of them! So fun to join you guys this month. You've got a great set of cards Tracey!! 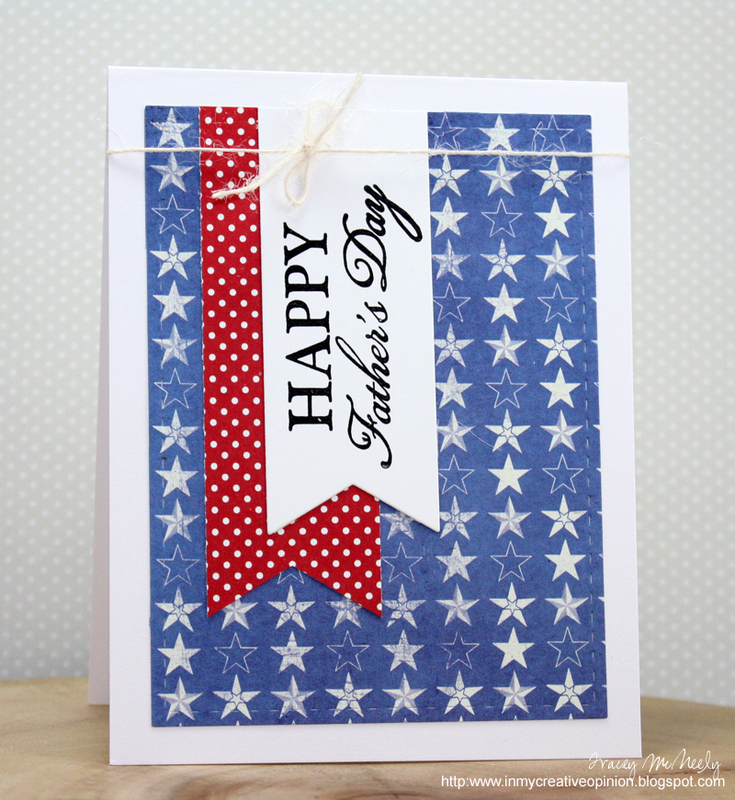 Didn't think to use the flags and washi the way you did - fabulous! Gonna be CASEing these with my leftover supplies! You did an amazing job with this kit, Tracey! I love every one of your cards...I really love how you have them lined up on the window sill, too! Hope you had a great weekend having everyone home with you! I'm a sucker for all things nautical anyway, but besides that, I LOVE your cards!!! Fun, fun, fun! What a fabulous lineup, Tracey! Such great inspiration for the guys in our lives! Each so unique and thoughtful in its very own way! Great job!